With vacation rentals, the space is key for families: Kids can run freely. Parents can enjoy their own room and don’t have to split the kids between two double beds and if you’re traveling with older kids you are saved the expense of booking multiple hotel rooms. I personally find having a kitchen the best feature in vacation rentals. Kitchens allow you to save a lot of money by avoiding the outrageous costs of mini bars, room service and eating out for every meal. Staying in for breakfast and letting the kids stay in their pajamas is just so much easier and more fun. Plus, when you recall your favorite family vacations you never picture your family crammed into a hotel room. 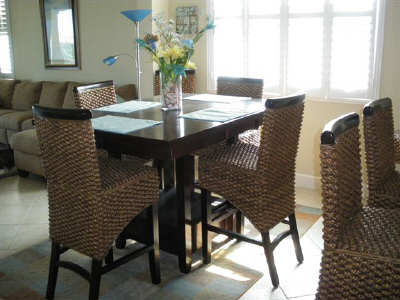 But if you stay in a vacation rental, I bet you will have lasting memories of your family sitting around the table during a meal, talking, laughing and feeling a true sense of relaxation and contentment.